Brighten up any interior with the Lush Brushed Steel Bar Stool Orange. Adding a beautiful burst of colour, the eye-catching faux leather upholstery in zesty orange simply cannot be ignored. The Lush is a tremendously tropical design that is destined to amaze. 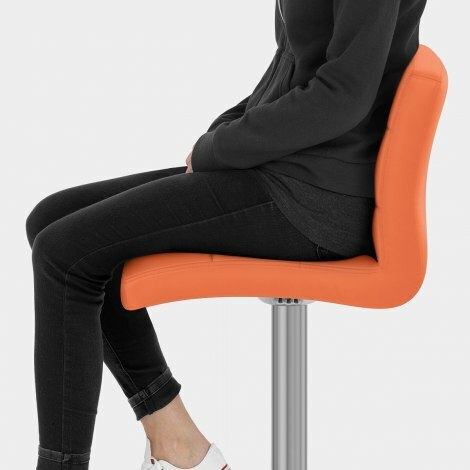 Amply padded for first class comfort, the supportive orange faux leather seat and backrest also exhibit horizontal stitching for a fashionable flair and focal point. Sculpted on a trendy brushed steel frame with a handcrafted rectangular footrest, its marvellously modern frame provides state-of-the-art functionality. As well as 360 swivel for fluid rotation, there is variable height thanks to a gas lift mechanism contained within the central column. Completed by a round base with a protective underside to help reduce marks to flooring, it is super practical too. Really pleased with our bar stools, the orange was a little brighter than in the picture but admit they look good. They arrived late morning the day after ordering, easy to assemble. Very comfortable. Definitely recommend. 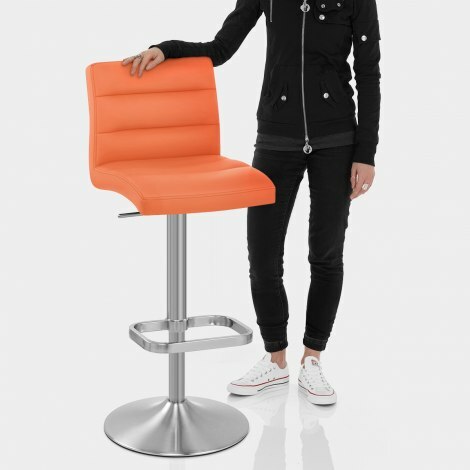 We chose two bar stools in orange to go with our new kitchen, we choose these as they just looked a better bar stool, thicker padding, wider base, easy to assemble only complaint too much polystyrene in the packaging. 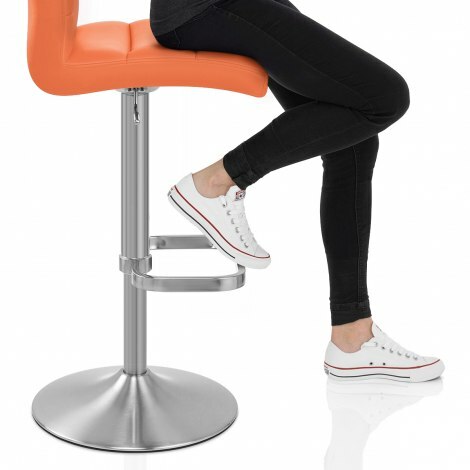 Bought 2 of these barstools for the kitchen breakfast bar in our new house. Went for these as they looked comfortable and stylish and I liked the colour and brushed steel base. These arrived in a big heavy box containing both stools ( probably a 2 man job to move comfortably). They were surprisingly easy and quick to assemble and they definitely filled the brief in terms of looking great, being easy to use and also being very comfortable to sit on. The perfect choice for us and a great addition to our kitchen. Very pleased bought one to see then ordered another.easy to assemble. They look fab. I was looking for some new bar stools for our new kitchen and these fit the bill perfectly. I compared prices across the internet and Atlantic offered the best value. Stools were delivered as promised and were as described. I would use Atlantic again.